The SNOMED CT view organizes the concepts into a tree by their IS A relationships. The default setting shows only the top-level concepts of the SNOMED CT terminology. Each top-level concept has its own dedicated icon that is also used for its children (e.g. 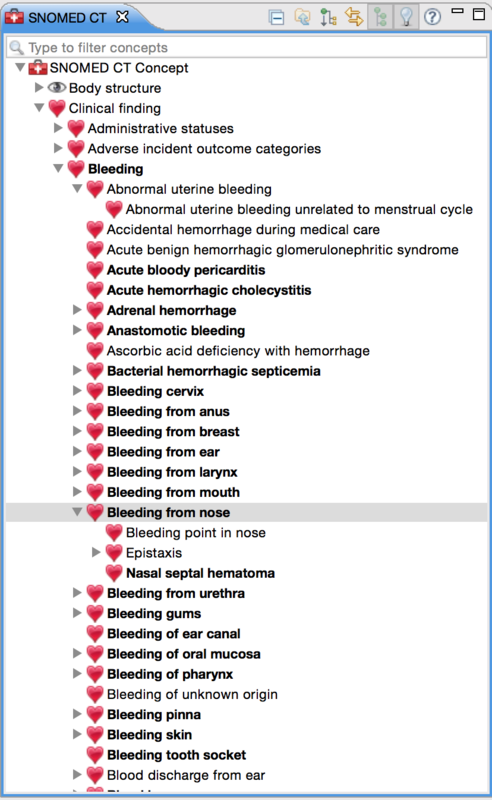 a heart icon for clinical findings). This way, top-level concepts and their children can be easily distinguished from each other, no matter where you are in the hierarchy or what function of Snow Owl you are using. SNOMED CT concept: This is the SNOMED CT root concept. Body structure: Normal (e.g. Entire femur) or abnormal (e.g. Vascular polyp) body structures. Anatomically abnormal body structures are found in the Morphologically altered structure sub-hierarchy. Clinical finding: Outcomes of clinical observation, assessment, or judgment, as well as normal and abnormal (e.g. Pulse fast) states. Clinical states that are necessarily abnormal (e.g. Acute allergic reaction) are found in the Disease sub-hierarchy. Environment or geographical location: Refers to different types of environments (e.g. Intensive care unit, Toxic environment, Cold zone) and locations such as countries, states, and regions (e.g. Burundi, Arizona, Island in the region of North America). Event: Occurrences (e.g. Accident, Exposure to carbon dioxide, Air travel, Environmental event). Procedures and interventions are excluded from this category. Observable entity: Entities that can be measured or observed (e.g. Age at first symptom, Blood pressure, Body temperature). Organism: Organisms that are relevant in human and veterinary medicine such as animals (e.g. Canis lupus familiaris), plants (e.g. Amaryllis), life-cycle forms (e.g. Bacterial spore), trophic life forms (e.g. Carnivore), chromista (e.g. Oomycota), and microorganisms (e.g. Fungus). Pharmaceutical / biological product: Drug products (e.g. Oral form aspirin, Alcoholic disinfectant, Lavender oil). This hierarchy has to be distinguished from the substance hierarchy, in which the chemical constituents used in pharmaceutical products are represented. Physical force: Different kinds of physical influences that are connected to injury. Examples: Detonation, Air and water pressure, Radiation, Mechanical stress. Physical object: Devices (e.g. Industrial machine), materials (e.g. Leather), instruments (e.g. Firearm), vehicles (e.g. Snowmobile) and other natural or man-made objects (e.g. Hospital bed, Silver jewelry). Procedure: Activity in the healthcare sector such as administrative (e.g. Death certification, Formal complaint about GP), invasive (e.g. Removal of wart), diagnostic (e.g. Complete blood count), imaging (e.g. Radiography of shoulder), educational procedures (e.g. Diet education), as well as referrals (e.g. Referral by clinical oncologist). Qualifier value: Qualifier value concepts are used as values for other SNOMED CT attributes. For example, the values for specifying the laterality of an ulnar fracture (i.e. Left, Right) are contained here. Record artifact: Documents that were created to provide information about healthcare related events or states of affairs (e.g. Anesthesia record, Birth certificate). Situation with explicit context: Concepts in this hierarchy specify the circumstances of a procedure, a finding, or a condition. They refer to procedures and conditions in the past (e.g. Injection given) or future (e.g. Awaiting radiotherapy), findings that can be ruled out (e.g. No cardiovascular symptom), or information about someone other than the patient (e.g. Family history of alcoholism). SNOMED CT Model Component: Core metadata concepts (provides structural information for international releases), foundation metadata concepts (reference sets, reference set attributes), linkage concepts (attributes, link assertions), namespace concepts, module concepts (e.g. national extensions), etc. Social context: Social aspects that may influence health and treatment of a patient. Concepts refer to social status (e.g. Lower middle class economic status), ethnic group (e.g. Caucasian), religion (e.g. Anglican), life style (e.g. Eating habit), family (e.g. Divorced parents), and occupation (e.g. Factory worker). Special concept: Inactive concepts (e.g. outdated concept) as well as some navigational concepts. Specimen: Samples or specimens that were acquired for examination or analysis. Examples: Blood sample, Genetic sample, Environmental swab, Specimen from bone marrow obtained by biopsy. Staging and scales: Concepts in this hierarchy refer to different instruments of testing and scaling: Assessment scales (e.g. Stanford Binet intelligence scale), classifications (e.g. Endometriosis classification of American Fertility Society), grading systems (e.g. Nottingham histologic grading system), symptom ratings (e.g. Chest pain rating) and tumor staging (e.g. Cancer staging). Substance: Substances and chemical constituents that are used for pharmaceutical and biological products, as well as body, dietary, and diagnostic substances. Examples: Diclofenac, Melatonin, Urine protein, Swimming pool water. You can expand or collapse the hierarchy by clicking the expand symbol (operating system dependent, but usually a plus sign on Windows and a small triangle on OS X) to the left of the concept. Expanding a node will reveal the children of a concept allowing you to browse down the hierarchy. As you continue to expand the children of a concept, you'll eventually reach the end of the line--a concept that doesn't have any more children. These concepts don't have an expand symbol. If you want to omit irrelevant high-level concepts or sibling concepts, you can set the concept as a root. Either by using the corresponding toolbar button or by right-clicking the concept and selecting Set as root concept. " To display the full terminology again, use the "return to root concept" toolbar button . If you want to reset the tree to its default state, click on the "Collapse all nodes" toolbar button of the view. If you've entered some text to filter the hierarchy, you can display the result as either a tree or as a flat list. You can switch between the two options by using the toggle between flat list and tree toolbar button . Many of these functions can also be accessed by right-clicking the concept in the tree. For example, you can right-click Clinical finding to set it as the root. Double-clicking a concept will launch the SNOMED CT concept editor (in the center of Snow Owl). It will also display the parents of the selected concept in the Parents view (bottom left). Tip: You can link the SNOMED CT editor to the SNOMED CT view with the button. 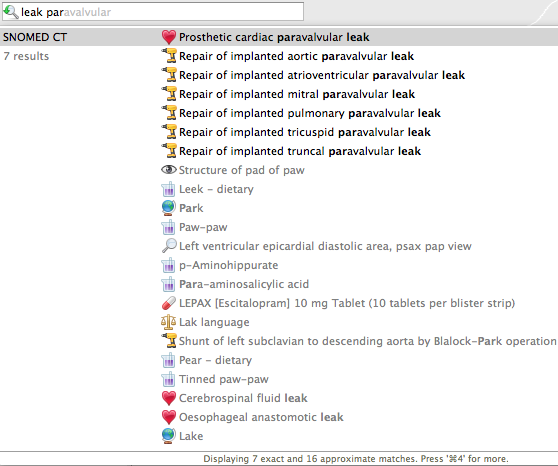 Whenever a concept is displayed in the editor, it will automatically appear in the hierarchy of the SNOMED CT view. This way, you can get detailed information about a concept and also observe where it's located in the hierarchy. There are three ways of doing searches with Snow Owl. The easiest way to do a search is by using the text field in the main tool bar. It's fairly similar to a Google search - you can use abbreviations, incomplete terms and even misspellings and still get meaningful results. You only need to type a few characters of each search term. For example, typing "bl pr st sy" will find Standing systolic blood pressure. The results are displayed as soon as you start typing. As you can see in the screenshot below the results are organized in different sections according to the underlying terminology (e.g. SNOMED CT, ICD-10, ATC, LOINC) or resource (e.g. Reference sets, information model components). Previously selected choices and bookmarks will also appear with the search results in their own sections. Tip: You can quickly jump to the quick search field with a shortcut key (Ctrl-4 on Windows / CMD-4 on Mac). You can also press the shortcut key to display additional matches. As you continue to enter search terms, concepts that start with all of the search terms will be displayed as exact matches. If there aren't enough exact matches to fill the search window, approximate results will also be shown in a gray font. These approximate matches may expand your search terms to consider synonymous words and misspellings, so you might find a few surprises. Tip: You can save time and typing effort by using the autocomplete function. Press Tab to accept the suggested term. The quick search uses some tricks to display relevant concepts according to your search history, your bookmarks, and your search profile. For example, the clinician search profile suppresses all veterinarian concepts and increases the ranking of terms most relevant to a clinician. 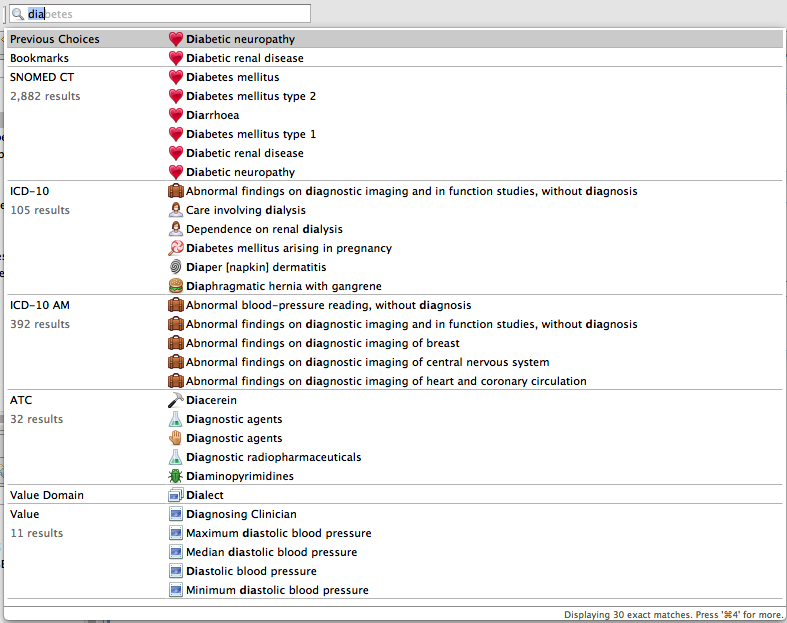 There are several built-in search profiles for medical specialties, like cardiology, neurology, opthalmology, etc. You can change your search profile in Preferences > Snow Owl > Search Profiles. Tip: If you're mostly looking for clinical findings and procedures, change your default search profile to "Clinician". You'll probably be much happier with the search rankings. Did you know? The results are sorted considering the frequencies of usage and other heuristics to determine the best matching concept. Exact matches usually take precedence over frequently used concepts. If you're the type of person who likes to think in hierarchies, this could become your favorite search tool. The same search functions as described above are used as well. Filtering the tree has a big advantage compared to the other searches, because you can see the concept in its natural habitat. For example, searching for lipodystrophy displays matching concepts and their relationship to each other. This way, you can choose a more precise (e.g. Membranous lipodystrophy) or a more general (e.g. 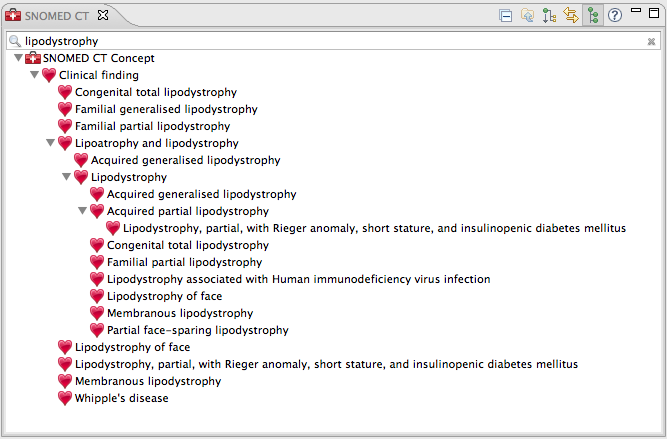 Lipoatrophy and lipodystrophy) concept. Did you wonder why Whipple's disease shows up in the search results? That's because Snow Owl's searches consider every description associated with a concept. However, a concept's preferred term is always displayed. This explains why Whipple's disease (which Whipple originally called intestinal lipodystrophy) appears in search results for lipodystrophy. The most sophisticated search tool is the advanced search, which can be invoked by clicking the flashlight button in the main toolbar. It allows you to perform searches on various kinds of resources (e.g. 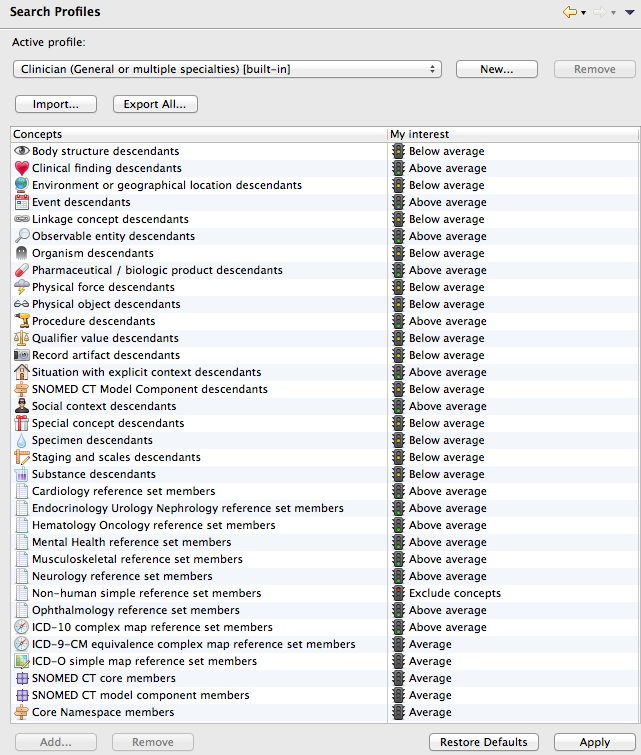 concepts, descriptions, references sets, tasks, files). Use the tabs on the top of the dialog box to pick your resource (e.g. SNOMED CT Concept search, ICD-10 Search) and type your query expression in the "Search for" field. Depending on the resource you selected, you will have different options for refining your search. For example, if you picked the SNOMED CT Concept search, you can restrict your search to a particular top-level hierarchy (e.g. Clinical finding) or based on the concept's status. 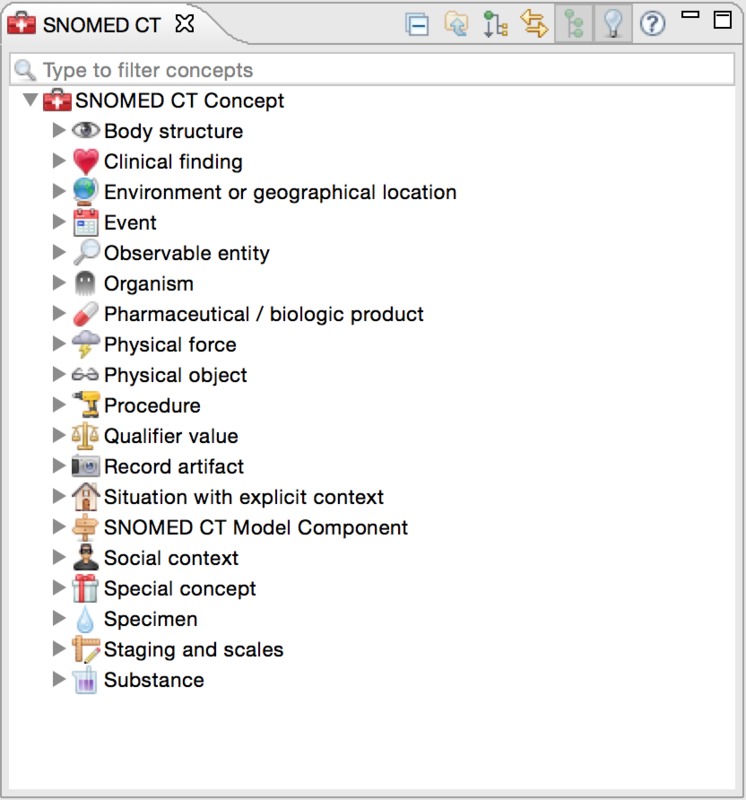 You can also search for SNOMED CT concepts based on concept ID, fully specified name, preferred term or a combination of these. To start the search, simply press the Search button on the bottom right of the dialog box: Your search results will be displayed as a list in the Search view. In comparison to the quick search, the results are now restricted to the pre-selected resource (SNOMED CT Concepts) and the top-level hierarchy ( Clinical finding) as you can see in the screenshot below. The results are sorted based on a similarity score which considers your search profile and the concept usage frequency, but you can change the sort order by clicking on the column headers. Results can be further filtered by typing text in the field on the top of the view. The advanced search supports wildcards, fuzzy matching, and Boolean operators.
? : substitutes a single character. E.g. the query Bra?il would match both Brasil and Brazil. *: substitutes any number of characters. E.g. the query pos*tive would match both positive and postoperative. Fuzzy matching helps you to find similar terms using a tilde ( ~). For example, the query rofexosib~ would match the correct term Rofecoxib. OR: medication OR change returns terms that contain either medication or change. AND: medication AND change returns terms that contain both medication and change. NOT: medication NOT change returns terms that contain medication but not change. You can also boost the importance of search term when combining search terms by using the caret symbol ( ^) and a number. For example, medication OR change^5 would rank concepts that contain the word change higher than the ones that contain the word medication. A number above 1 increases the boost, and a number below 1 (e.g. 0.3) decreases the importance of the term. Did you know? You can also search for concepts based on their semantic meaning, or even use expert-level scripting functions to completely customize a search. You can learn the semantic query syntax by running the Getting started with semantic queries examples in the Project Explorer view.